So Aiden is not quite walking yet...but I know that he is capable. I see him standing by himself for long periods of time and when it looks like he is about to take a step he squats down!!! Ugh...I am anxious with anticipation for when he FINALLY takes those steps. Anywho, when I noticed that Aiden wanted to stand up more and push things around I did some research on kids and shoes. We all love to see our babies in cute little shoes but the reality is that shoes restrict the foot growth and bone development. So try and keep those cute li ttle shoes on your baby as short of periods of time as possible. When it IS time to get your baby into some walker shoes make sure you get some with flexible bottoms. I love See Kai Run shoes!!!! 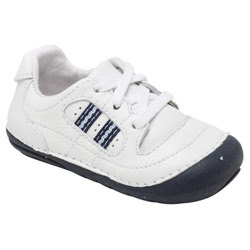 And my Mommy bought Aiden some really cute pre-walker shoes from Stride Rite. Aiden has REALLY big feet (size 6.5) for an 11 month old so they only had one pair in his size..lol. Boy oh Boy!!! Aiden was born in the summer so I didn't really have to worry about shoes for a while, but I felt like when it got colder he should have shoes on his feet...lol. Well I was wrong (even though he was cute in his little Old Navy Shoes), so get some REALLY thick socks and keep those feet warm!!!! If and when you decide to put your baby in shoes make sure you get their feet measured and that the shoes are a half size to big. AND MEASURE OFTEN!!!! You don't want your baby's feet to be scrunched up. I remember calling my pediatrician while I was in a shoe store dying to by Kinsley some cute little kicks. Well of course, the doctor shut that idea down really quick. She gave me the same advice that you gave, barefoot is best. So I agree, out with the old rules, in with the new, no shoes for my baby until she was already fully walking.